Cylinder Targets enable you to detect and track images rolled into cylindrical and conical shapes. They also support the detection and tracking of images on the flat top and bottom faces of the Cylinder Target. You can create Cylinder Targets with the Vuforia Target Manager by defining the side length and diameters of the Cylinder Target and adding the images that you want to detect. Cylinder targets can be used to recognize and track product packaging that are cylindrical or conical in shape. 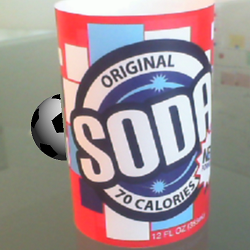 Soda cans, coffee cups, mugs and beverage bottles are good examples. Cylinder Targets support the same image formats used for Image and Multi-Targets. The are created with the Vuforia Target Manager using JPG or PNG images in RGB or grayscale. The size of the input images must 2 MB or less. Features extracted from these images are stored in a database, which can then be downloaded and packaged together with the application. Cylinder Targets should be viewed under moderately bright and diffuse lighting. The surfaces of the object should be evenly lit. Indoor scenarios generally work well. When designing Cylinder Targets that are going to be wrapped onto physical objects, you'll need to consider these factors. The placement and coverage of the image on the object - e.g. does it fully or partially wrap around the object's surface? The necessary size and shape of the image itself. Once you've designed your target images, you can upload them to the Vuforia Target Manager. You'll need to define the dimensions of the Cylinder Target and can also evaluate your target images. You can find Cylinder Targets sample projects in the Core Features samples for Unity, Android and iOS on the Sample Downloads page. Apply the following recommendations to improve the performance and user experience of Cylinder Target applications. Try to reduce the amount of gloss and reflectivity of the cylinder object, since this can affect target recognition and tracking accuracy. To track all sides of the object, make sure that the features are sufficiently distributed all around the target. Consider using the top or bottom image, or both, of the cylinder target to enhance the tracking experience. This tip is especially important when the user is expected to look at the target from above or from below. Use 3D augmentations with symmetrical shapes relative to the main target axis. Use billboard augmentations, that is, augmentations that are always facing the viewer (camera). Use 2D augmentations, such as text labels, that appear in 3D space near the target but are always facing the viewer (similar to the billboard context). Prevent the user from viewing the target object from multiple angles, that is, limit the range allowed of viewing directions. Consider using top or bottom images, or both, to make the orientation less ambiguous. This tip is especially important when users are expected to see the target slightly from above or from below. In the application, the developer should communicate to the user the qualities of a good target so that the application can successfully acquire a target. An ideal cylinder target includes the following attributes, as listed in this table. Rich in detail The side, top, and bottom images of the cylinder target should have sufficient detail. These images should be well distributed across the cylinder surface or across the portion of cylinder that is expected to be tracked in the application scenario. Good contrast The side, top, and bottom images should be well-lit and have bright and dark regions. The following figure shows an example of side image for a cylinder target. The Target Manager turns the original image into a masked image based on the target parameters (side length, top, and bottom diameter). Also, on the right side of the figure, the masked image features are highlighted. The following figure shows an example of the top (or bottom) image for a cylinder target. The Target Manager turns the original image into a masked image, based on the top or bottom diameter parameter. Also, on the right side of the figure, the masked image features are highlighted. Finally, the following picture is an example of a cylinder target with 3D augmentation. The coordinate axes are highlighted to illustrate the cylinder reference system. The origin of the local reference frame is located at the center of the bottom side of the cylinder, with the Z-axis oriented vertically. The parameters of a Cylinder Target must be defined in the Target Manager when creating a new Cylinder Target. The following table provides guidelines for defining these values. 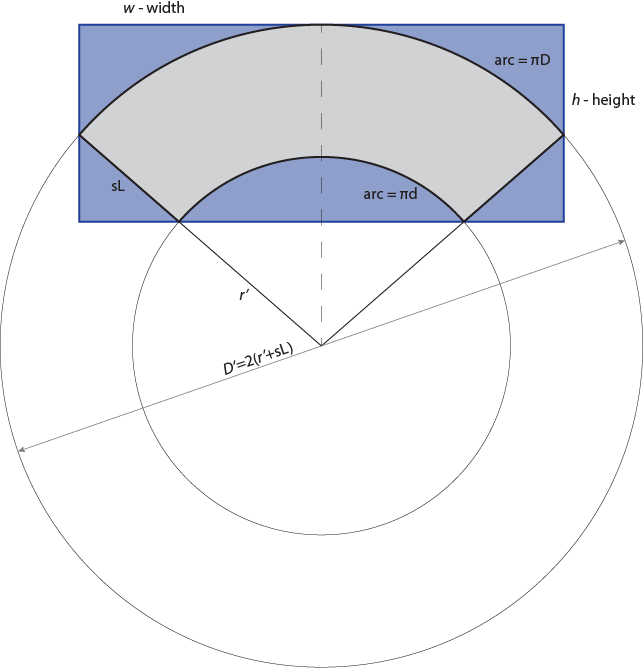 The bottom diameter of the cylinder target in 3D scene units. Developer must specify the bottom diameter when creating the target online using the Target Manager. The bottom diameter cannot be changed explicitly in the dataset XML file. Note: The bottom diameter of the cylinder target can be changed at run time. This provides a flexible way to define or update the scale of the target in your 3D scene. Changing the bottom diameter at run time results in a uniform scaling of the cylinder targets in 3D space, that is, the top diameter and the side length of the cylinder are also rescaled to preserve the original proportions. The top diameter of the cylinder target in 3D scene units. Developer must specify the top diameter when creating the target online using the Target Manager. The top diameter cannot be changed explicitly in the dataset XML file. Note: The top diameter of the cylinder target can be changed at run time. This provides a flexible way to define or update the scale of the target in your 3D scene. Changing the top diameter at run time results in a uniform scaling of the cylinder targets in 3D space, that is, the bottom diameter and the side length of the cylinder are also rescaled to preserve the original proportions. The side length of the cylinder target in 3D scene units. Developer must specify the side length when creating the target online using the Target Manager. The side length can be changed explicitly in the dataset XML file. Note: The side length of the cylinder target can be changed at run time. This provides a flexible way to define or update the scale of the target in your 3D scene. Changing the side length at run time results in a uniform scaling of the cylinder targets in 3D space, that is, the bottom and top diameter of the cylinder are also rescaled to preserve the original proportions. A system-wide unique identifier (string) to identify cylinder targets across any other datasets. Note: Developers looking to use cylinder target in combination with Positional Device Tracker should specify the target size in meters. These example objects are not all perfect cylinders. However, at least a part of these objects are very close to being a cylindrical shape, around which you can build an augmented reality (AR) experience. You may already have access to the original imagery from the agency or the brand. If so, be aware that those images tend to have a lot of additional information clearly indicated, such as cutting edges, gluing areas, and overlapping areas. This additional information is critical because it tells you how the label is wrapped around the physical object. When you know this information, you can determine the cylindrical portion that is relevant for the AR experience. In some cases, you do not have the label imagery or you want to design your own label image. In such cases you must manually measure the relevant dimensions of the physical object and use the dimensions in the Target Manager when you create a cylinder target. To create a cylinder target, you must extract the correct dimensions of the actual physical object and of the label to use in the Target Manager. In most cases, the images of can labels tend to cover the whole can, for a full 360 wrap. If you have a label image, print the label image and cut out just the label part. Recognize that the label contains all the artwork plus some overlap area at the seam, where the print is stitched together, or where the edges are folded in or cut out when the label is actually placed on the can. If you do not have the label image, use an empty sheet of paper. Measure the label area height on the can. Then cut a rectangular strip from your paper to have the same height. Note that your paper model (strip) can be the correct height, but it still can be too long. Wrap the paper model around the physical can and try to fit it as tightly as possible. Mark the overlap area with a pencil. Cut away the overlap area so that the paper model fits exactly and that it closes on the seam with no gap and no overlap. At times, the bottle labels do not cover the whole bottle, in both height and circumference. Some labels are only on the front side of the bottle. Yet other labels can be a small band that wraps around the bottle but covers only a part of the bottle height. The following description covers the front label case. Print the label image on a letter sized/A4 sized paper. If you do not have the label yet, use an empty sheet of paper (A4 or letter should fit in most cases). Cut out the label as depicted below. The label extends as much as possible to both sides but is cut out tight on the bottom and top boundaries. Make sure that the strip is long enough to wrap around the bottle. If you do not have the label image yet, just crop your paper so that your paper has the same height that the label image will have. Crop it to the correct size. Wrap your paper model around the physical bottle and fit it as tightly as possible. Cut away the overlap area, so that the paper model fits exactly and closes on the seam with no gap and no overlap. Bottle labels do not usually cover the whole bottle. Some labels are only on the front side of the bottle, while other labels wrap around the full 360 but cover only a part of the bottle height. The following description covers the case where a band label wraps 360 around a bottle. If you have the label image, print the label image and cut out the label part. Recognize that the label contains all the artwork plus some overlap area at the seam where the print is stitched together. If you do not have a label image, use an empty sheet of paper. Measure the height of the label area on the bottle. Then cut a rectangular strip from your paper to have the same height. Note: Your paper model (strip) can be the correct height, but can still be too long. Wrap your paper model around the physical bottle and try to fit it as tight as possible. Cut away the overlap area, so that the paper model fits exactly and that it closes on the seam with no gap and no overlap. 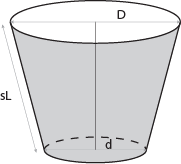 A cup-shape in this section is not a uniform cylinder. The bottom of a cup usually has a smaller diameter than the top of the cup, resulting in a somewhat conical shape, similar to the shape of a coffee cup. In most of these cases, the label images for these cups tend to cover the whole cup, with a full 360 wrap. Wrap the paper around the physical cup and try to fit it as tight as possible. Crop it to the correct size. This is the tricky part. Mark the overlap areas with a pencil. NOTE: Another way of to get the paper model is to actually cut the cup open and unroll it. Unroll the paper model and measure the size of the label, which is the length and breadth of the rectangle. The dimensions are circumference x side. Use the guidelines below to create a digital image of the label. Design your own label or adjust an existing label image to fit the required aspect ratio (circumference: side). Use your favorite image tool to create an image that has the same aspect ratio as your paper model rectangle circumference: side. Choose the resolution so that you have at least 240 pixels for the smaller side (in most of the cases this is the height). Design your new label and save the image to be your target image. Use your favorite image tool and crop, or resize, your original label image exactly to this measured size. Make sure that you are cutting away the same overlapping area that you have cut away on your paper model. Make sure that the image aspect ratio is equal to the aspect ratio of your measurements - circumference : side. The image should look the same as your paper model. Save this image as your target image. Increase the canvas size of the image if the image aspect ratio is larger than the required one. Just add white areas, or white bands, at the top and/or bottom of the original image so that the overall canvas matches the required aspect ratio. The following figure is an example of this option. This option can be applied in all cases, in either an aspect ratio smaller or larger than the required one. The non-uniform rescaling makes the image match the required aspect ratio. However, an obvious side effect of a non-uniform rescaling is that the resulting image appears stretched with respect to the original image. The following figure is an example of this option. Unroll the label image and measure the rectangle that contains the paper model. The size will be width and height. See the example below to understand where to measure. Create a digital image of the conical label. Either design your own label or adjust an existing label image to fit the required aspect ratio (width : height), using the following guidelines. Use your favorite image editing tool and crop your original label image exactly to the measured size. Make sure that you cut away the same overlapping area that you cut away on your paper model. Make sure that the image aspect ratio is equal to the aspect ratio of your measurements width : height. Save this image for use as your target image. Use your favorite image editing tool to create an image that has the same aspect ratio width : height. Choose the resolution so that you have at least 240 pixels for the smaller side. In most of the cases, this is the height. Design the new label and save the image to be the target image. Although you may want to use the full image for your design, be aware that only the area that is covered by the paper model is considered for recognition and tracking. When adjusting the graphic to make it fit into the given area (to correspond to the unrolled surface), you can consider a few other options that are similar to the cylinder case. Adding top and/or bottom bands can ensure that the image correctly wraps the conic object. However, the actual trackable details will only partially cover the available height. The following figure is an example of this option. Adding side bands can ensure that the image correctly wraps your conic object. However, the actual trackable details will only partially cover the available surface, restricting the trackable area to a range < 360 degrees. The following figure is an example of this option. You can adjust the size of the image in a non-uniform way, without keeping the original image proportions, to force the image to fit into the required cone outline. The following figure is an example of this option. The side effect of this approach is that the image can look stretched with respect to the original image. Unroll the paper model and measure the rectangular size of the label. The size will be circumference x side. Divide the circumference by 3.14 to get the diameter of the cylinder. Add a new target of cylinder type. Set the Top Diameter to the cylinder diameter. Set the Side Length to the cylinder height (). Set the Bottom Diameter to the cylinder diameter. Download a device database that contains a cylinder trackable that works with your can. Unroll the paper model and measure the side length. The following figure illustrates this action. Fold the paper model again and glue it together with transparent tape. Measure the top and bottom diameter of the paper model. Set the Top Diameter to the measured top diameter of the paper model. Set the Side Length to the measured side length of the paper model. Set the Bottom Diameter to the measured bottom diameter of the paper model. Download a device database that contains a cylinder trackable that works with your cup. 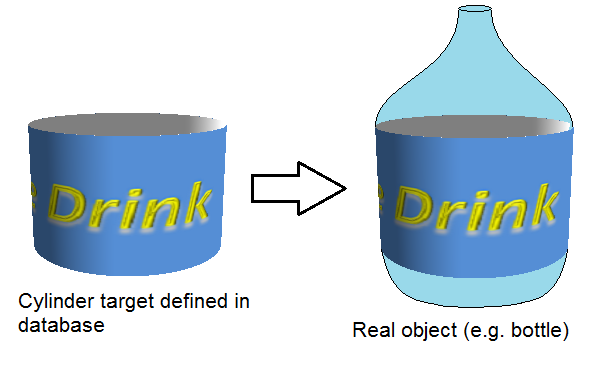 When you upload the side image of a Cylinder target to the Target Manager, you must consider the actual shape of the object. Make sure that the uploaded images correctly encapsulate the flat body of the real physical object. The flat body represents the side surface of a cylinder or cone object if it were unrolled into a planar surface. The mathematics involved are particularly relevant when the shape of the object is a cone or a conic frustum. 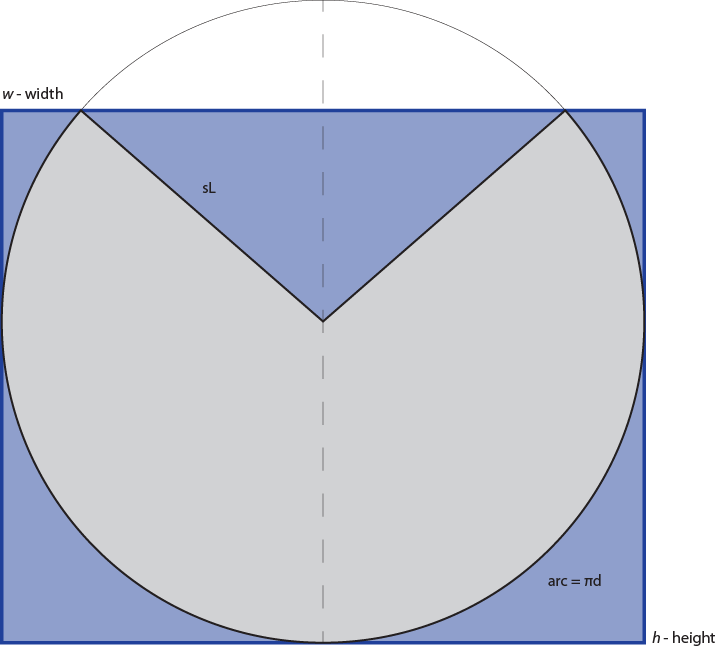 The following image shows a generic conic frustum shape, which represents the most general case for cylinder targets, and its key geometric parameters. sL – is the sidelength of the object. 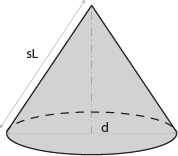 d and D are the diameters of the conical object (with d < D) and sL is the side length of the object. Note: For the general case, the side length must not be confused with the cylinder height. However, for the special case of a true cylinder, where the top and bottom diameters are identical and the side surface is aligned vertically, the side length equals the height . 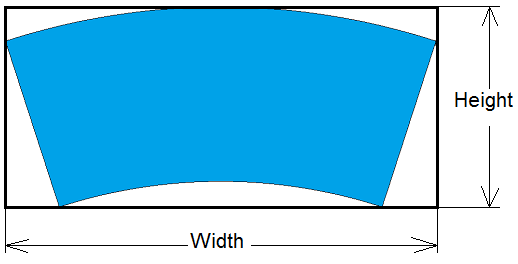 The following figure shows two different shapes for the flat side surface. All other instances (cones, for example) are variations on these shapes. The following sections are divided into Case 1 and Case 2, which describe two methods of computing the width and height of the enclosed image. The shape enclosed between the two circles and the rays is the unrolled surface of the truncated conical shape. The circular segment must be oriented in the target image so that it is symmetric on the vertical image axis (the dashed line). The segment borders must touch all four sides of the image. In this case, the difference between the top and bottom diameters is larger than the cylinder side length. The construction of the flat image is similar to Case 1, but uses this figure as a reference. 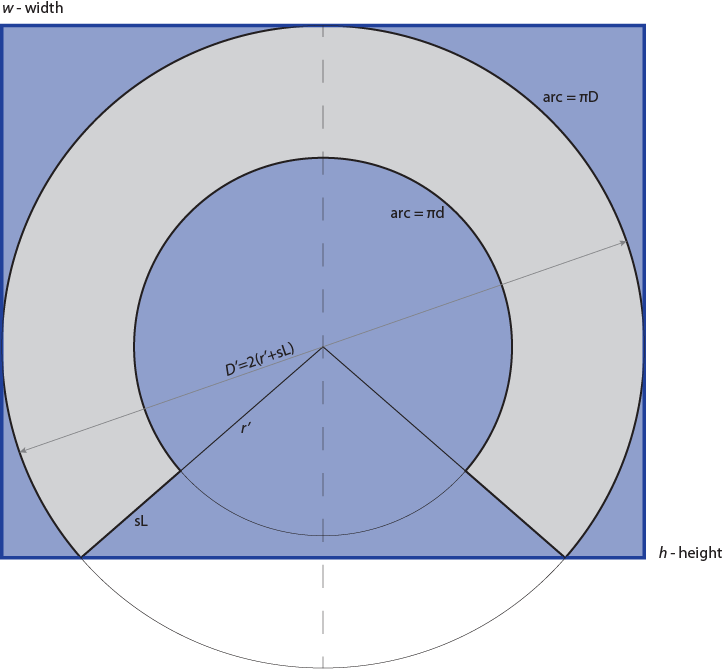 The width and height of the image for the cylinder s side surface can be computed from the given parameters and from the computed values for the constructing circles. This formula defines that the actual bitmap aspect ratio can deviate by 2% from the required computed ratio. This deviation can be helpful when existing objects are used by cutting, unrolling, and scanning. The cylinder is a special case of the generic conical shape since the cylinder has straight edges as shown in the following figure. 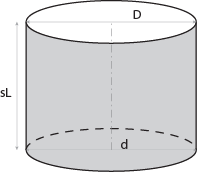 The top and bottom diameters (d, D) are identical, and the side length simply corresponds to the cylinder height. Note: The flat body must be oriented so that the vertical image axis (dashed line) is parallel to the object vertical axis and it fills the image area. 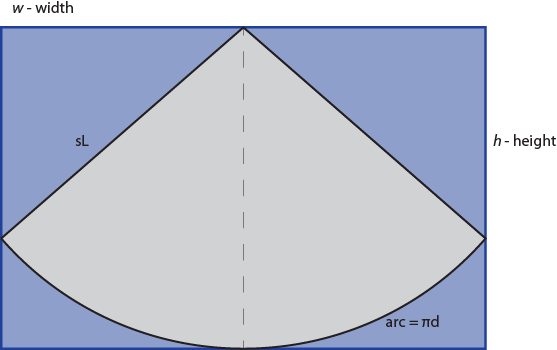 A cone is another special case of a generic conical shape. The cone is characterized by a sharp tip on either the top or the bottom, so that one of the diameters (top or bottom, D, or d) is zero. See the cone example in the following figure. h = sL– height of target image = side length. w = 2sL– width of target image = twice side length. Note: The cone segment must be oriented such that the target image is symmetrical on the vertical image axis (the dashed line). The segment borders must touch all four sides of the image. The Cylinder Target sample apps make use of an occlusion model. The model is meant to hide the virtual objects (the augmentation) whenever they are located behind the cylinder, as seen in the following figure. In the figure, the virtual ball (augmentation) appears hidden, or occluded, by the real cylinder. If you followed the steps described in How To Create an Image for a Cylinder, you may have with a texture that covers only a part of the real cylinder object, such as a portion of your bottle s side surface. In this situation, your cylinder target may correspond to a subpart of the real geometry. This statement is illustrated in the following example. In such a case, you must adjust the occlusion model used in the sample (or in your application). From a computer graphics perspective, the occlusion model effect is realized by rendering the full cylinder object geometry to the depth buffer of the graphics card. This approach ensures that any object that has greater depth than the cylinder will not be rendered. In Unity, a 3D model representing the full geometry of the real object is attached under the Cylinder Target game object, and a Depth Mask shader is applied to its Mesh Renderer. Using the native SDK (Android or iOS), the effect is obtained by rendering the whole geometry of the object to the depth buffer only, by disabling the color mask.